To make Delve a great experience for everyone in your network, make sure that you and your colleagues store and share your documents where Delve can get to them: in OneDrive for Business or SharePoint in Office 365. 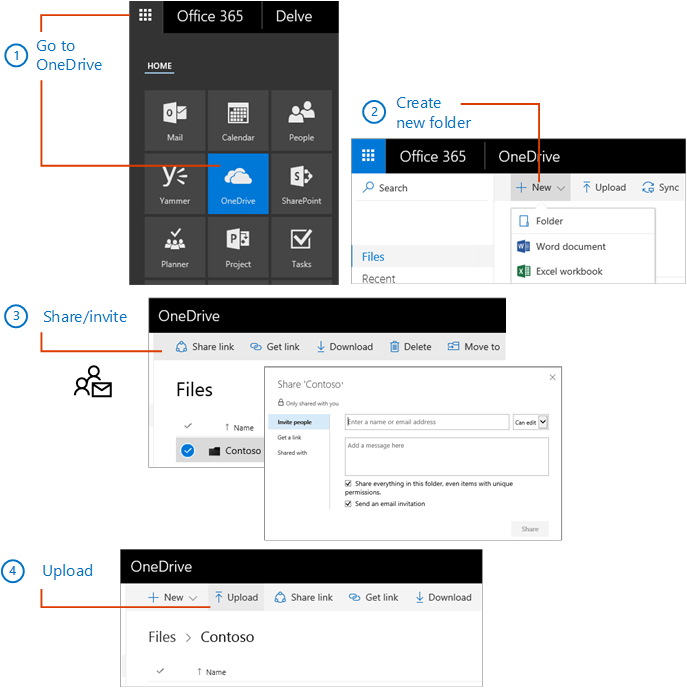 If you see very few or no documents in Delve, you can start storing your documents in OneDrive for Business and share them with your colleagues. It may take a little while (sometimes up to an hour) before the new and uploaded documents appear in Delve for you and the people you shared them with. Your colleagues will not see your private documents, for example documents you've stored in private folders in OneDrive for Business. To share your documents, create a folder and invite people you work with. At the top of the page, select the app launcher , and then select OneDrive. Type a name for the folder, and then choose Create. Select the folder, and choose Share link. Enter names or email addresses, and then choose Share. Open the folder and upload existing documents or create new ones. When you add documents to this folder, only you and the people you invite will be able to see the documents in Delve and work on them together. Other people will not be able to see them. To share documents with everyone in your organization, you can create a folder called Shared with everyone (or a similar name) and enter Everyone in the Share dialog box. Then upload or create documents. If you already have a Shared with Everyone folder in OneDrive for Business, you can upload or create documents in that folder. To share individual documents, select the document in OneDrive for Business, click Share link, and then enter names or email addresses. If a document is a collaborative effort related to a project, then saving it to a team site might be a better choice. Go to the site where you want to create and upload documents, for example your Team Site. Create and upload your documents. Everyone who has access to the site, can also see the documents in Delve. Documents that are shared as attachments in emails show up in Delve for people in the email conversation. People you've sent an attachment to, can find the document on your page. You'll only see attachments in Delve if you're using Office 365 email. Attachments in email messages protected with Rights Management Services (RMS) will not show up in Delve. I uploaded documents, but I don't see them in Delve? It may take a little while (sometimes up to an hour) before the new and uploaded documents appear in Delve. Once they're there, any changes you make to the documents should appear in Delve within minutes. Are my documents safe in Delve?